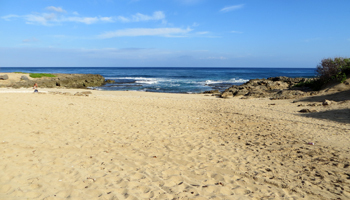 The Kaena Point North Shore Trail is a Fun and Easy Scenic Hawaii Hike. The Northern Half of Oahu's Final Frontier! The coastal hike to the lighthouse at Kaena Point (north shore route) is a round-trip 9.5 km (5.9-mile) walk from the end of the road in Mokuleia to the western tip of Oahu and back again. As far as Hawaii hiking goes, this is an easy trail – with elevation changes of less than 100 feet – along a dirt road that used to be the old railroad route from Honolulu to Haleiwa. What makes this remote location truly unique, however, is that there are no paved roads from Yokohama Beach on the Waianae (West) Coast to Mokuleia on Oahu’s North Shore. 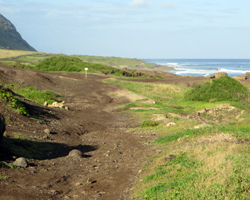 As a result, Kaena Point is also a popular place to drive recreational vehicles. But even off-road vehicles can cover only part of the distance from either direction. It’s impossible to drive the entire coastline from road-end to road-end. 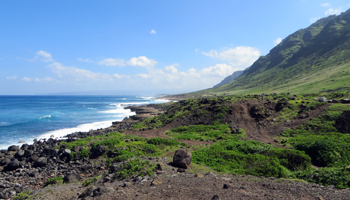 Kaena Point can also be reached by hiking the west shore route. To get to the trailhead (northern route) take the H2 Freeway going north and then stay on it until the freeway ends and it becomes Wilikina Drive, which becomes Kaukonahua Road, which becomes Farrington Hwy. Basically just keep taking each left fork until the paved road literally ends. Then you’re there. There’s a large dirt parking lot at the end of the road on the right. But if it has been raining recently, you might want to park along the side of the road. Your car could easily get stuck in the mud and ruts when things get wet. First of all, the north shore coastline along the trail to Kaena Point is absolutely gorgeous! On one side, you’ll see endless clear blue water with jagged spines of lava rock jutting out into it, tide pools, and secluded beaches that are suitable for swimming, snorkeling, and fishing. 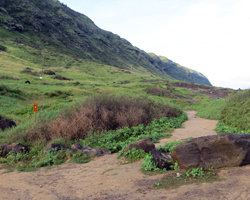 Then on the other side, you’ll skirt the steep volcanic slopes of the Waianae Mountain Range. 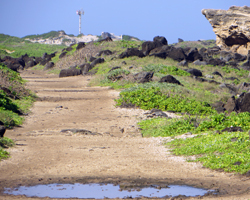 Because Kaena Point is a nesting area for seabirds, pets are forbidden (except service animals); and it’s important that you stay on the marked path once you pass through the gates into the reserve. You might notice holes in the ground on both sides of the path. These are all shearwater nests. 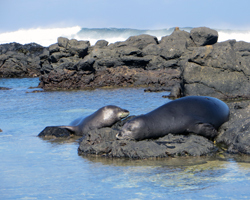 In addition to birds, you can hope to see whales (usually in winter), green sea turtles, and/or Hawaiian monk seals – all of which are fairly common sights in this area. For example: I hiked the Kaena Point north shore trail twice in February when I went out to watch humpback whales… The first of these two Hawaii hiking adventures was a great day for whale watching, but a lousy day for hiking. 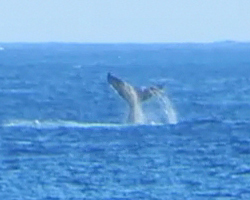 We had more than 50 whale sightings in just a couple of hours. But because it had rained for the whole week prior, the trails were so soft we couldn’t walk them. 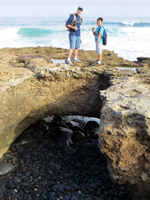 It was easier to hike across uneven lava, loose rocks and sand along the water’s edge than it was to stay on the trail. Like I said: we saw a lot of whales, but we didn’t get anywhere near the lighthouse. Two days later, however, I went back to give it another go. At that time, the trails were dry and hard – except for pools of standing water in the rutted parts of the road. These were easily avoided. I had another 50+ whale sightings and I made it out to the lighthouse in less than an hour (including frequent stops to take pictures). I also saw two Hawaiian monk seals, one green sea turtle, and a few dozen seabirds. Basically, it was a great day to be out hiking Kaena Point. Hawaiian monk seals are one of the rarest marine mammal species in the world. It's illegal to disrupt or harass these animals in any way; so keep your distance. Interestingly, the north route was way better than the alternative on that particular day because the winds were so strong that the ocean on the west side was very stormy – making it hard to see the whales. Meanwhile, the north side was calm and clear (see panorama photo in the footer of this page). I just got lucky that day because those are not the normal wind conditions. Regardless of the fact that it rained a lot before my most recent Kaena Point adventure, this corner of Oahu is generally one of the hottest and driest parts of the island. Make sure you pack plenty of water and use your sunscreen – even when it’s cloudy. One of the two worst sunburns I’ve ever suffered was from my first experience hiking this exact trail on a very overcast Thanksgiving Day in the early 1980’s. That’s when I made the unpleasant discovery that the sun’s damaging ultraviolet rays go right through the clouds without any hindrance; and without any sunscreen, I got cooked. Take my word for it… it was bad! Along the whole route, there are numerous little secluded beaches and coves where you might want to explore the tide pools, go for a swim, or spend the day. Just remember that north shore surf can be extremely dangerous – especially when it’s crashing into jagged rocks. If you’re going to get near the water, make sure you pick a day and/or location that will be safe for you. And if you’re going to spend the day at the beach, remember to carry out everything that you packed in with you. This is a place of great natural beauty, and it’s a nature reserve. Please help keep it that way. 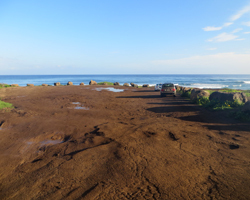 There’s a trash can in the parking lot at the trailhead, and there’s a porta-potty down the road at Mokuleia Beach Park. The lighthouse at the end of the trail is no big deal. 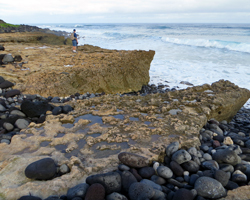 Hiking Kaena Point is about the beauty of the journey rather than a payoff at the finish. And you’ll never see the sights if you don’t stop to look around. As I hiked this trail, I talked to several other people along the way. At least half of them had no idea there were literally dozens of whales in plain view just a few hundred meters off-shore. If you’re going to do this hike anytime between October and May, you might want to take a look at my whale watching page for tips to help you spot our biggest annual visitors. Disclaimer: Stupidity and carelessness can kill you. Use your brain and take responsibility for your own safety. Know the limits of your ability and stay within them. Watch your kids like a hawk. Heed posted warning signs. Stay on the marked trails. Never turn your back to the waves. Bring lots of water and snacks. Use your sunscreen. Live to enjoy the rest of your Hawaii vacation!